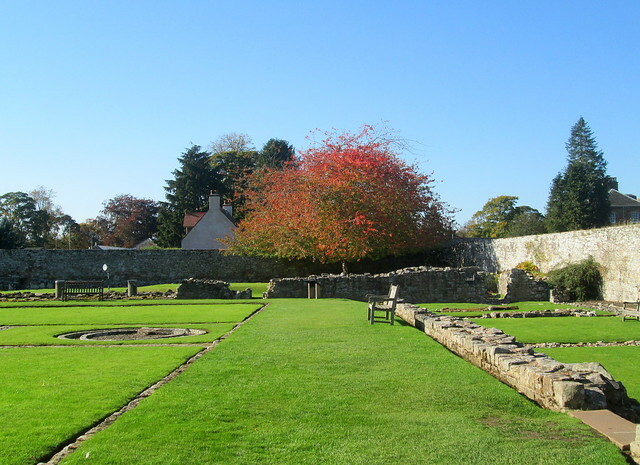 I took a lot of photos when we visited Melrose Abbey in the Scottish Borders, so I thought I might as well do another post about it. 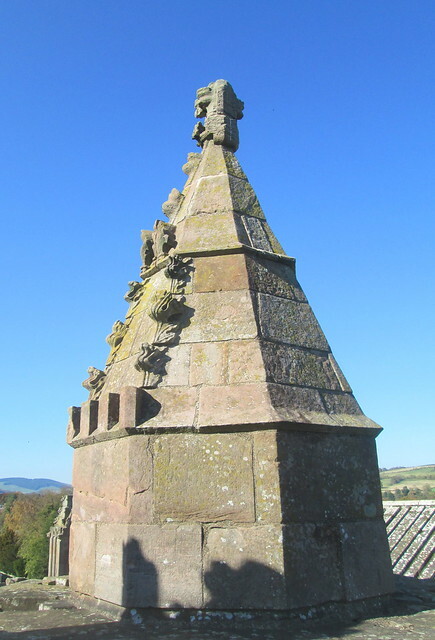 This finial is on the roof, you have to trek up a lot of stairs to get this photo. The grave markers below are really part of the inner walls, I suppose it was only very wealthy people who could afford to be buried there and if any other members of the family want to be laid to rest there then the paving slabs beneath can be lifted to slot them in. 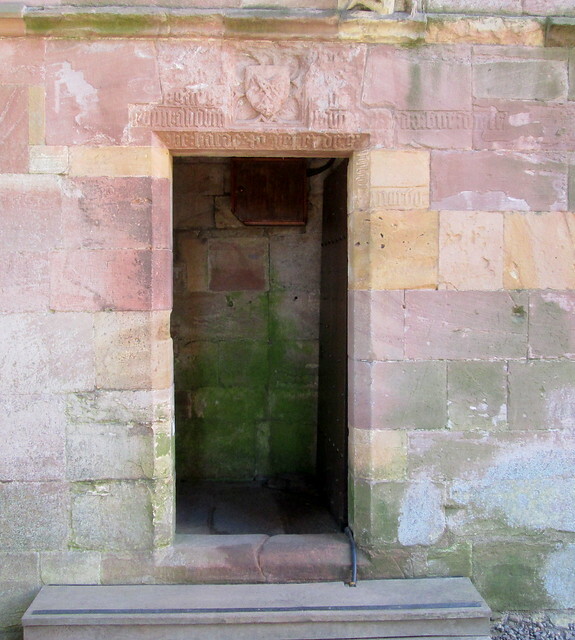 A lot of the stonework has been eroded by the weather but you can still get an idea of the original decoration. 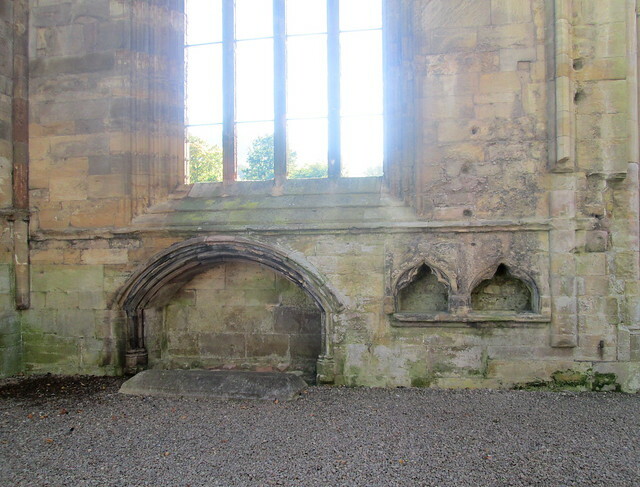 The abbey must have been split up into different chapels in parts as there are several of these piscinae (wee alcoves) which were where the water was kept for the priests to wash their hands. 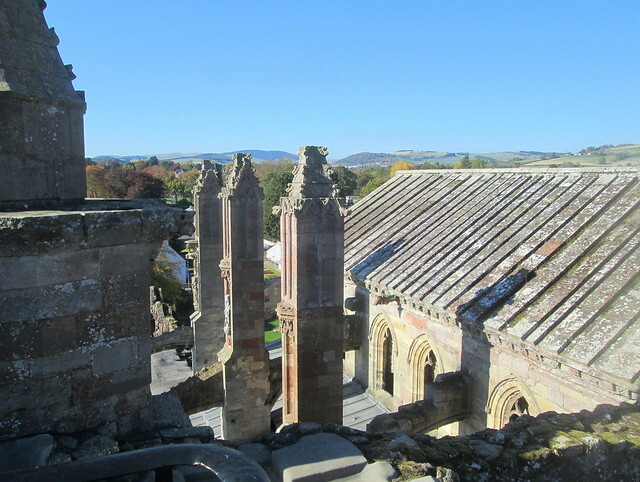 The photo below is from the highest point of the roof. It’s definitely not for people who suffer from vertigo! I find that I get dizzier if I’m on the ground looking up though. 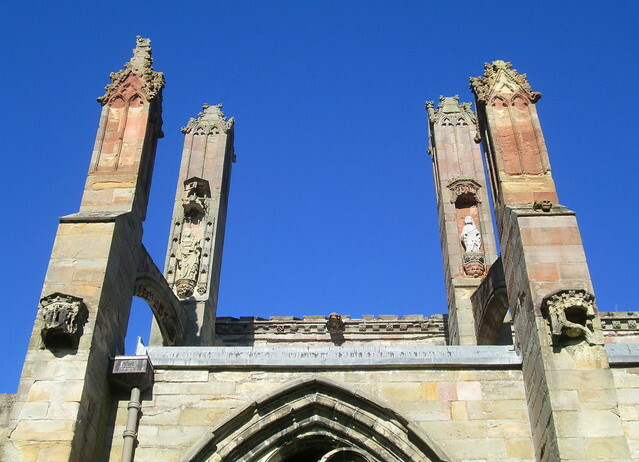 Hundreds of years ago some religious fanatics climbed this building to knock hell out of the carved images of saints which they objected to, it looks like some of them more or less survived, maybe those ones were just too difficult to reach. In its heyday this abbey must have been a vast complex, far more of it is just ruins in outline, presumably the stones were carried away for house building at some point. 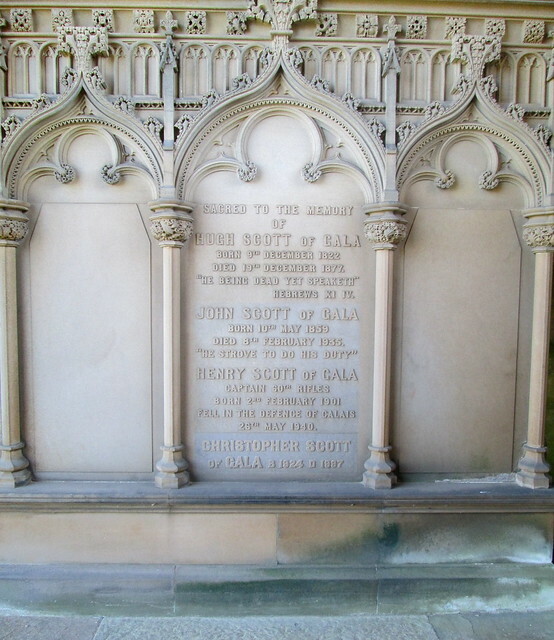 If you happen to be in the Melrose area it’s a good idea to fit in a visit to Sir Walter Scott’s home – Abbotsford, which is not far from here. As you can see we were very lucky with the weather, it was the last warm day of what has been a great summmer or should I say autumn as these photos were taken towards the end of October. 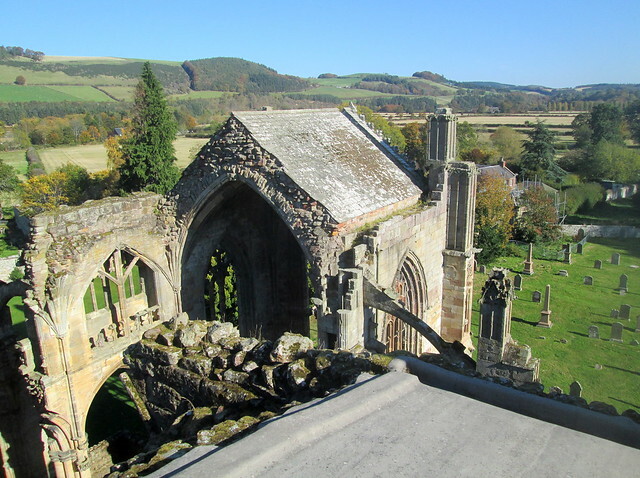 This entry was posted in Architecture, Scottish History and tagged Cistercian Abbey, Melrose Abbey, Scottish Borders by Katrina. Bookmark the permalink. I, for one, thank you, Katrina, for doing what I could not have done: climbing to the top to get those fabulous photos! 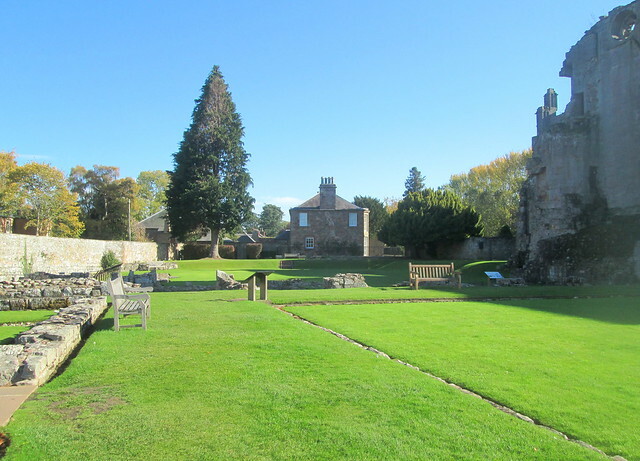 It is a stunning place, so full of history. I’m glad you had such nice weather. Luckily there’s always something to hang on to when you get up there and I only look straight down once to see how high it is! I am marveling at the deep-blue clear skies you had that day! What a perfect day for these photos. Gorgeous photos, really. I can feel myself there. Such a treat! It was a really gorgeous day and the photos are lovely to look back on.